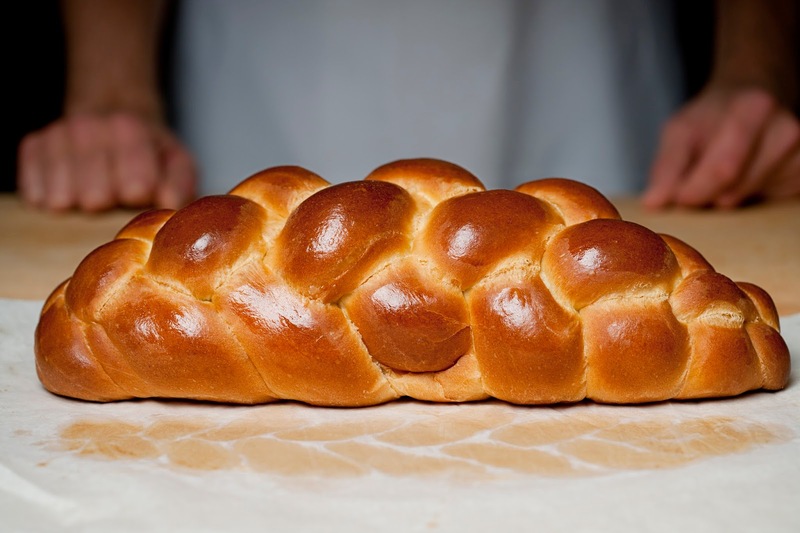 Our Challah recipe for a satisfying holiday feast! From "The Fundamental Techniques of Classic Bread Baking"
1. Combine the Flour, water whole eggs, egg yolks, honey, yeast, and salt in the bowl of a standing electric mixer fitted with the hook. Mix on low speed for about 5 minutes, or until the dough starts to become shaggy (mixed, but not smooth in texture). 2. Add the sugar, and continue to mix for 3 minutes. Increase the mixer speed to medium and mix for 5 minutes. Decrease the mixer speed to low and add the oil in a slow steady stream, mixing until fluffy and incorporated. 3. Lightly butter a large bowl or container. 4. Scrape the dough into the prepared bowl. Cover the bowl with plastic film and set aside to ferment for 45 minutes. 5. Uncover, fold, and gently press the dough to degas. Again, cover with plastic film and set aside to ferment for 45 minutes. 6. Lightly flour a clean, flat work surface. 7. Uncover the dough and divide it on the floured surface into twelve 5 ¼ oz. logs for 3 strand braids. Cover with plastic film and bench rest for 15 minutes. 8. Line the sheet pans with parchment paper. Uncover the dough and, if necessary, lightly flour the work surface. Carefully roll each piece of dough into a neat cigar-shaped log about 14 inches long. 9. Working quickly to keep the dough from drying out: Place 3 strands parallel to each other. Starting at the center, bring one outside strand over the center of the middle strand. Grab the other outside strand and fold it over new middle strand (noting that the first outside strand has become the middle strand). Repeat this process until you reach the end of the strands. 10. Pinch the ends together. 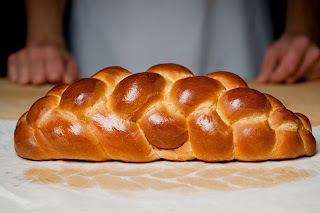 Flip the braided strands over so that the finished section is away from you. Continue braiding as before to completely braid the loaf. Roll each end gently to seal. 11. To make the egg wash, combine the egg with 1 tbs. water, whisking to blend. 12. Place two loaves on each of the prepared sheet pans. Using a pastry brush, lightly coat the top of each loaf with the egg wash (do not discard the remaining egg wash). Cover with plastic film and proof for 1 ½ hours. 13. About an hour before you are ready to bake the loaves, preheat the oven to 350˚F. Uncover the dough and again, using a pastry brush, lightly coat the top of each loaf with the remaining egg wash.
14. Transfer the pans to the preheated oven. Bake for 35 minutes, or until the crust is golden brown and shiny and the sides feel firm to the touch. 15. Remove from the oven and transfer to wire racks to cool.